So its been getting cold here, like really cold, and I’m not at all used to it after spending the last four years in the tropical city of Darwin. 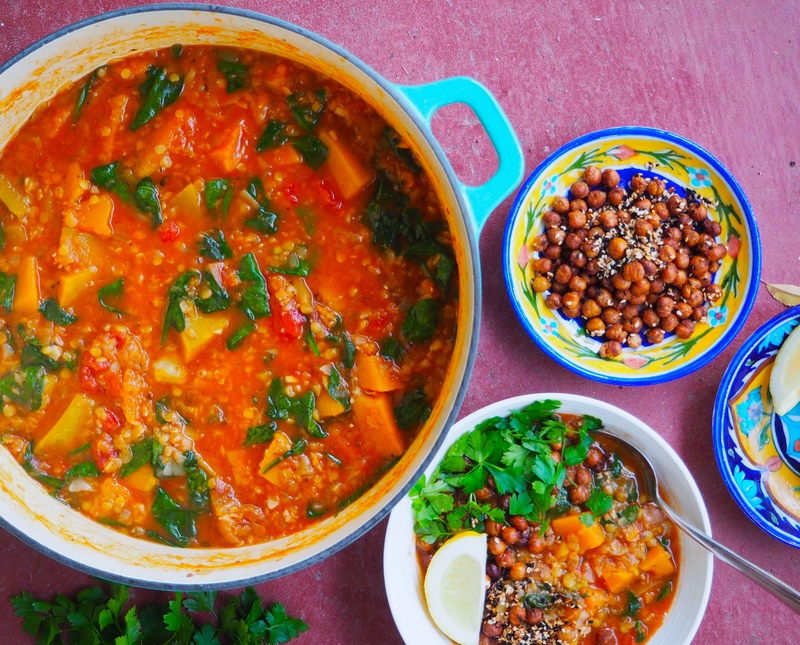 So today I warmed up from the inside out with this tagine. I also lit the fire so the house was pretty warm. But really the tagine did most the warming. This is the perfect warming dish that you can just set on the stove and forget about for the next couple of hours while delicious smells waft through your kitchen. It’s a must if your feeling cold. The chickpeas are really worth turning the oven on for. They are crispy, salty and spicy and when they mix with the sweet creamy pumpkin its so delicious! 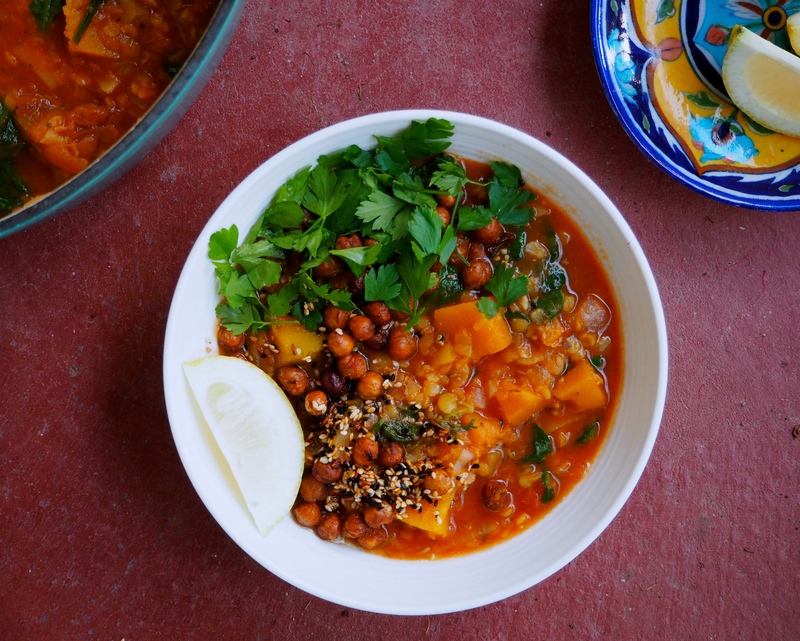 Plus leftover chickpeas (if any!) would be a great snack anytime of day. Or tossed through a sale for extra crunch, yum. It might seem like the ingredients list is rather long but its mostly spices, and the chickpeas can be roasted ahead of time and stored in an airtight jar for a couple of days. I would recommend preserving your own lemons, someone in your street probably has a tree dripping with lemons when in season. Jamie Oliver has a great recipe, otherwise, they are a small fortune to buy at the shops. Now after eating this I’m starting to think that perhaps winter isn’t so bad after all! Heat the oil in a large cast iron pot over medium heat. Add the onion and saute for 5 minutes. Add the garlic and continue cooking for another 5 minutes or until soft and beginning to colour. Meanwhile, roughly crush the coriander and cumin seeds in a pestal and mortar. Add the cinnamon and a dash of water. Add to the onion mix. Stir over the heat for another couple of minutes then add the capsicum, artichokes, preserved lemon and chilli. Continue to cook for a few more minutes before adding the pumpkin, lentils, tin tomatoes, dried mint, dates, vegetable stock and thyme. Rinse out the tomato tin with water, adding at least 3 C to the pot. Bring to the boil then turn down to low and cover, simmering for 1 and a half to 2 hours. Give it a stir whenever you fancy and break up the whole tomatoes. Just before serving stir through the baby spinach until just wilted. Slice the lemon and roughly chop the parsley. 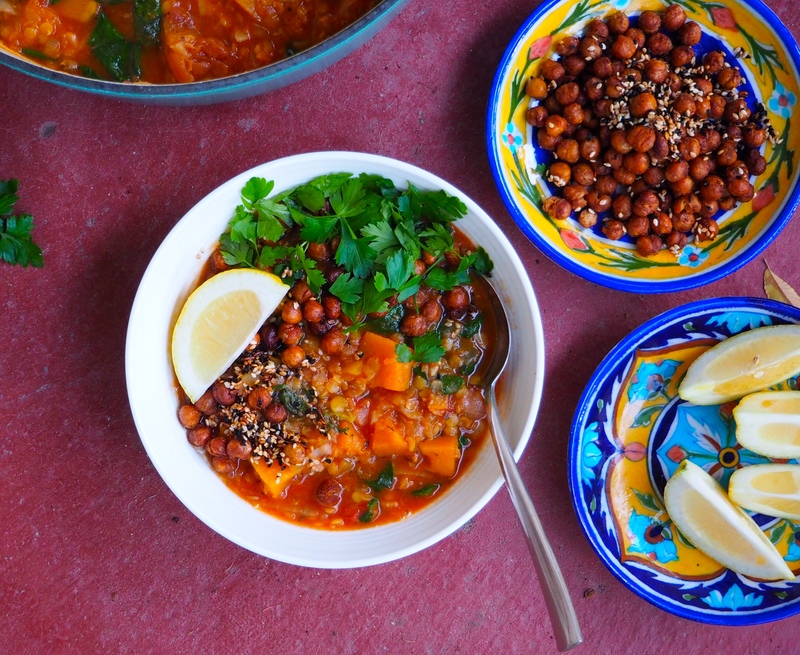 To serve, place into bowls and top with spicy roasted chickpeas, lemon wedges and parsley. To char capsicums simply place them whole under your grill and turn until all the skin is charred and black. Cover for 5 minutes then carefully peel off the skin. Preheat the oven to 200 degrees celsius. Line a baking tray with baking paper. Toss all the ingredients in a bowl then put onto the baking tray. Generously sprinkle over some Himalayan sea salt flakes. Bake for 35-45 minutes, or until golden brown. Any leftovers can be stored in a airtight jar for a couple of days. yumm looks so delicious and tasty!! !